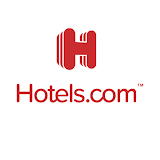 My dad works away quite often, and spend a lot of time in hotels. He always brings back the freebies you find in the bathroom (a trait inherited from my Grandad!) and then doesn't use them. Every so often I have a root around in the bathroom cupboard to see if he's stumbled across any gems - and I struck gold when I discovered the This Works: sleep kit which retails for £10. When I was little I always struggled to sleep because my eczema meant I'd be itching all night, and I can't say the situation is much better now. These products are aimed at helping you to relax at bed time, and to ease you into a better natural sleep. I have to say, I think they work! 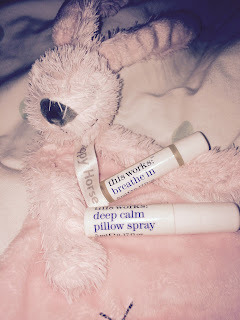 deep calm pillow spray // this little spray is enriched with three essential oils: Lavender, Vetivert and Camomile. Mixed together create such a gorgeous smell, and as the scent lingers all night. I find it to be so relaxing as the scents remind me of a nice massage! I genuinely do think this spray aids a better night's sleep. I don't smell any lavender in this at all, I have to say - which is good because Sam hates lavender and we're pretty much always together! 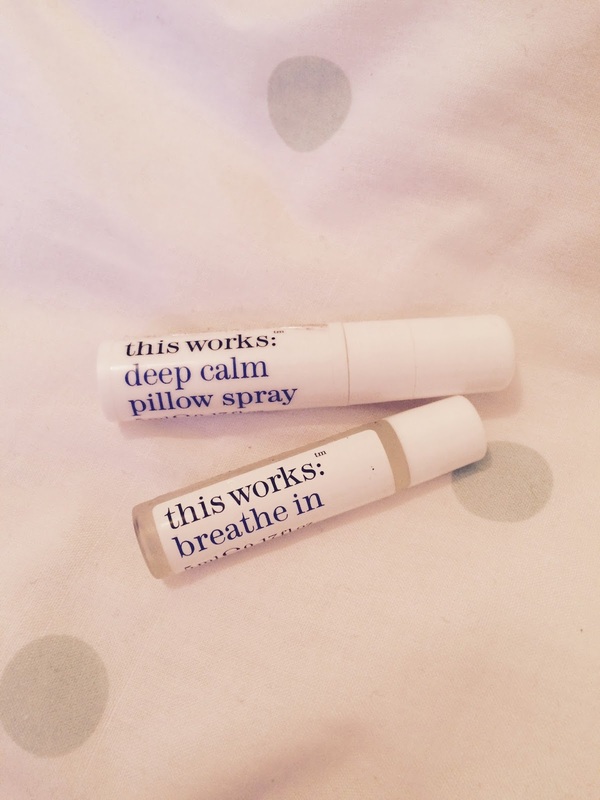 breathe in // this product is a little roller ball - which means it feels lovely and cooling. You apply it to your pressure points (I always put it on my wrists and occasionally the side of my neck are those pressure points? Who knows) and that means you breathe in the blend of Eucalyptus and Frankincense. 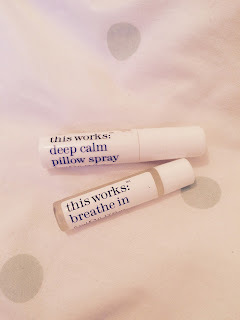 I don't use this when I'm going to bed, but I use it if I'm going on a long-ish flight where I'll be trying to sleep, or if I'm in a situation that typically causes anxiety: exams, job interviews and train journeys. I actually DO smell a lot of lavender in this one. Strange that. I love the branding of the products, and I definitely think the set is worth £10 as it's lasted me ages, even though they're teeny tiny, and they really do work! Do you have any recommendations from This Works? This looks great! And good idea for using it on long flights. I might have to try this out :) great review.